"Plague of Sharks" in the Gulf of Maine – Ya Like Dags? Gimme your fish and no one gets hurt. Photo by Andy Murch. I found this story on Underwater Times and thought it was interesting given how deep into fisherman/shark relations any work with dogfish requires you to go. Apparently a new shark has begun to assert itself as one of the dominant pest species in the Gulf of Maine. 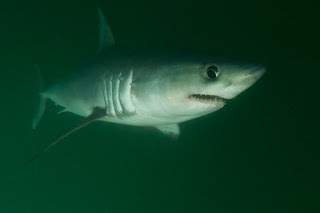 This shark is the porbeagle (Lamna nasus) and the fact that it is now being put on the same level as the humble dogfish says a lot about the relationship between sharks and people and state of the Gulf of Maine fishery. The porbeagle is most definitely not a dogfish. This is a large, highly predatory shark that is closely related to the great white and shortfin mako, two superstars of the shark world. Like all mackerel sharks it is capable of maintaining a body temperature above that of the surrounding water, making it well-adapted to the cold Gulf of Maine. While the status of the spiny dogfish as an endangered species is under heavy debate, there is little debate that the porbeagle has suffered under overfishing, and has been for a while. The IUCN lists this shark as “Vulnerable” and as such it is subject to very low quotas in US fisheries. So what is causing this large, charismatic, endangered shark to be mentioned in the same breath as the reviled dogfish? Apparently in the last three years they’ve made a bit of a comeback in the Northwest Atlantic and have started hitting the gillnets of Gulf of Maine fishermen. According to the above article, porbeagles are chasing off valuable fish, destroying gear, and stealing the catch faster than the fishermen can haul it out. As a result, fishermen are calling for higher quotas to thin the population. Sounds eerily familiar, doesn’t it? 1- The fisheries of the Gulf of Maine have declined to a point where the return of a top predator, normally a sign of a healthy ecosystem, now represents direct competition with fishermen. 2- Sharks, whether they are spiny dogfish or porbeagles, are intelligent, highly adaptable animals that know how to take advantage of an easy meal, and the sheer amount of fishing occurring in New England has conditioned them to seek out fishing gear and feed out of it. 3- Due to the constantly fraying relations between fishermen and managers (some of which may be fueled by the dogfish debate), a short-term increase in porbeagle abundance is not seen as a sign of success, but as a sign of mismanagement. In any case, these are interesting times for fishermen, managers and conservationists alike. As shark conservation becomes more serious (and potentially successful) it can be expected that this sort of debate will happen more often.